There are some laws that no matter how hard you try; you just can’t seem to change them. What goes up must come down and movies based on video games can never be great. While the first law is unbreakable the second one I mentioned has been broken one or two times but they have not changed the status quo. There are myriad of reasons why most video-game movies never succeed (that’s for a future editorial) but the Resident Evil series of films are still standing, so much so it has earned the Guinness World Record of “most live-action film adaptations of a video-game”. Over the span of 15 years it has made 6 movies (including this one we are reviewing) and has grossed over $1 billion at the worldwide box office despite their modest budgets and the negative reception the movies have received. For those who aren’t familiar, Resident Evil started as a series of video-games that revolutionized the survival horror genre through its first three iterations and spin-offs and the highly acclaimed 4th game in the series that changed the industry again as it was the progenitor to a lot of mechanics one would see in modern third-person shooters. The recent entries (barring the recent Resident Evil VII) have lost their way because it abandoned its horror roots in favour of action set pieces that attempt to rival Call of Duty. With that said, the games are still Capcom’s highest selling Video games. I’ve said it once and I’ll say it again with great success comes sequels, spin-offs, merchandise and movies. For the last 15 years we’ve seen Paul W.S. Anderson take advantage of the series success and fandom as he has taken the drivers seat with the film series, which is loosely based on the games. 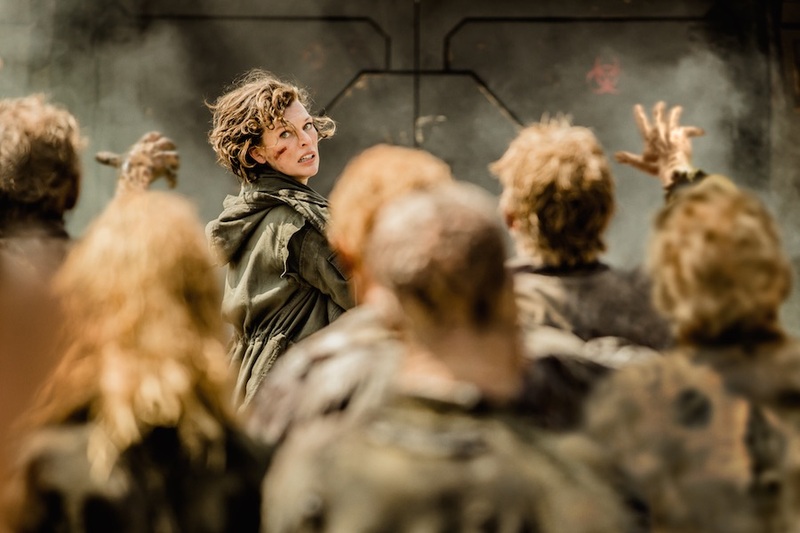 Unlike the games, the movies follows original character Alice (Milla Jovovich) who is constantly trying to survive the zombie apocalypse and take down the evil Umbrella Corporation who spread the Zombie infection. Even though the movie doesn’t follow the video-games storylines it still takes its time to honour it with the games unique zombies and monsters and its protagonists and villains who get relegated to supporting character status. Set after the events of the 5th film Resident Evil: Retribution, Alice (Milla Jovovich) has found herself wandering a post apocalyptic world on her own after surviving a battle against Albert Wesker (Shawn Roberts) and the evil Umbrella Corporation in Washington DC that ended up being a set-up. The battle left the human race on the brink of extinction and Alice without her super human abilities. Alice gets chased down by a horde of zombies. Alice finds an unlikely ally in the form of the Red Queen (Ever Anderson), an Artificial Intelligence from Umbrella’s super computer who tells Alice that the corporation has developed an Anti-virus for the T-virus that brought about the Zombie apocalypse and bio-weapons (Alice included) that terrorize the earth. She discovers that the anti-virus is secured in an Umbrella Corp facility buried under the streets of Raccoon city where the virus broke out. Alice has 48 hours to travel to Raccoon City to find and unleash the anti-virus before Umbrella launch their final attack on the remaining pockets of civilization. Alice decides to go to the deserted city with the goal of saving the rest of the world from further extinction. Along her journey she finds her old ally Claire Redfield (Ali Larter) who runs a settlement filled with survivors and also get chased by the founder of Umbrella Dr. Alexander Isaacs (Iain Glen) with his horde of zombies. Alice, Claire and her comrades decide to launch a final assault on both Isaacs and Wesker, in the process they uncover more secrets about Umbrella’s shady past and Alice’s mysterious past she has no recollection of. Despite his many attempts to find gold with an IP that is rich with lore, can Paul W.S. Anderson finally end this series on a high note or should it be left alone to devoured by zombies? 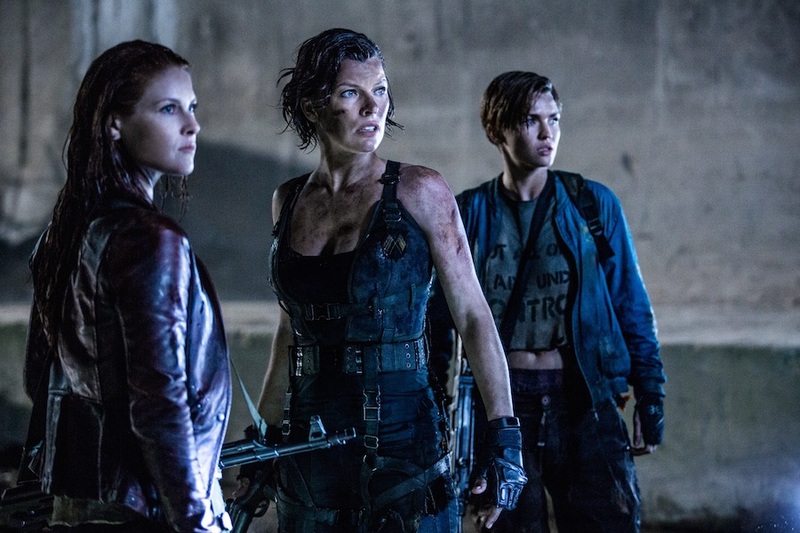 Claire Redfield (Ali Larter), Alice ( Milla Jovovich) and Abigail (Ruby Rose) look on. The movie pacing is frantic as the movie pushes you on from one action sequence to the other with little breathing room in between. Adrenaline junkies ‘might’ appreciate this. Please not that there is huge emphasis on might. Milla Jovovich gives a serviceable performance as the film’s main protagonist Alice. She continues to show her prowess as an action-star and her ability to do demanding stunt work and she has once again successfully empowered her character and made her a badass despite how one-dimensional the character actually is. But a movie of this type doesn’t necessarily need deep characterization, just a decent amount that makes the character likeable. Iain Glen as Dr. Alexander Isaacs is without a doubt the best part of the movie in my honest opinion. The Game of Thrones star is clearly having fun with his character and hams up the performance as the megalomaniac doctor to the nth degree that makes his character a guilty pleasure to watch. For those who are fans of the Resident Evil games (myself included) will enjoy the references the movie makes towards the game through the Umbrella corporation, the monsters /bio-weapons who have appeared in various games and characters like Claire Redfield who is portrayed by Heroes alumni Ali Larter and the video-games resident villain Albert Wesker who is played by Shawn Roberts whose role is sadly reduced in this movie and Raccoon City, the location where the earlier video-games and movies took place. Alice takes aim at Umbrella Corp agents. Most of the film’s supporting cast are just there to be canon fodder and they are extremely forgettable because of the film’s pacing. The movie doesn’t develop their character as it doesn’t give us a moment to learn about their back-story or personalities, which as a result turns them into typical horror movie clichés and their eventual demise doesn’t raise the stakes, as we don’t know them or care about them for that matter. The movie doesn’t even give us the time to see if they are even capable actors or actresses as their lines are said in a brisk manner and they don’t get the opportunity to flex their acting chops the way Iain Glen or Ali Larter does. Other than the film’s opening recap, there really isn’t much of a story here and what little story the movie has is extremely predictable. The movie progression is simply terrible as the movie has a habit of jumping from one set piece to the other without rhyme or reason and most time without a much-needed break. It feels like a video-game from the 8 or 16 bit era as each scene is played out as a character walking through a figurative and sometimes literal corridor shooting and killing zombies and monsters only to fight a mini boss or boss in the form of bio-weapon or henchman at the end of a scene. Because of this contrived approach to storytelling the movie’s doesn’t get a satisfying pay-off. Visuals and effects are simply terrible and not very convincing. They don’t even compare favourably to a PS3 game and they look like they were made for a low budget TV-series. The biggest problem the movie has is the editing. 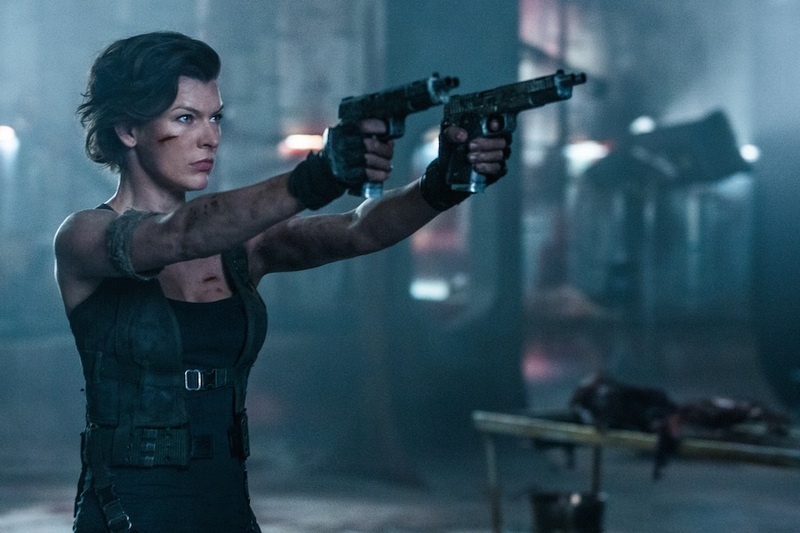 The style of editing used is not cohesive as the movie resorts to constant use of shaky cam shots which robs the film of any tension as we cannot see the monsters faces or body most times and it also makes a mess of the fight scenes and as a sizeable chunk of the stunt work that Jovovich and many others did become incognizable. This means that many of the scenes are just there and are completely devoid of excitement or scares. Alice and Claire prepare to battle with their new allies. 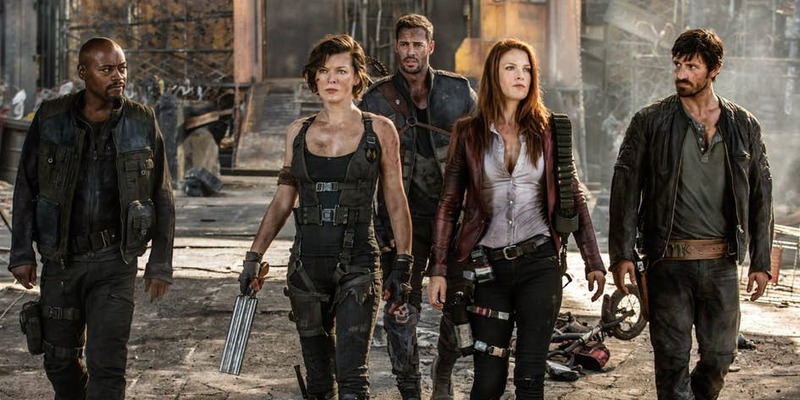 Resident Evil: The Final Chapter is a dumb and loud action movie that never reaches its potential thanks to a largely non-existant story , under-developed characters , bad editing which undermines a good chunk of stunt work and a conclusion that is not really satisfying for people who have watched all the movies before this one. Can’t recommend this one to fans and non-fans of the series.